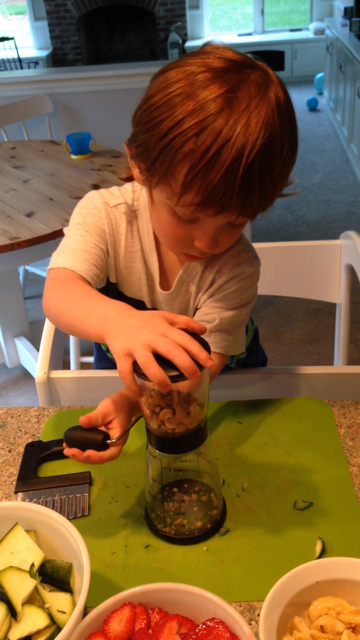 A recent FB post of Wade chopping and prepping food for dinner generated great interest in kitchen tools for toddlers. Here are some ideas, as requested! Wade used his crinkle cutter before he was 2 but has really improved. I have to give little ones credit – I remind Wade but he is good to set the cutter and then move his fingers out of the way when he pushes down. This time Wade used a slicer. 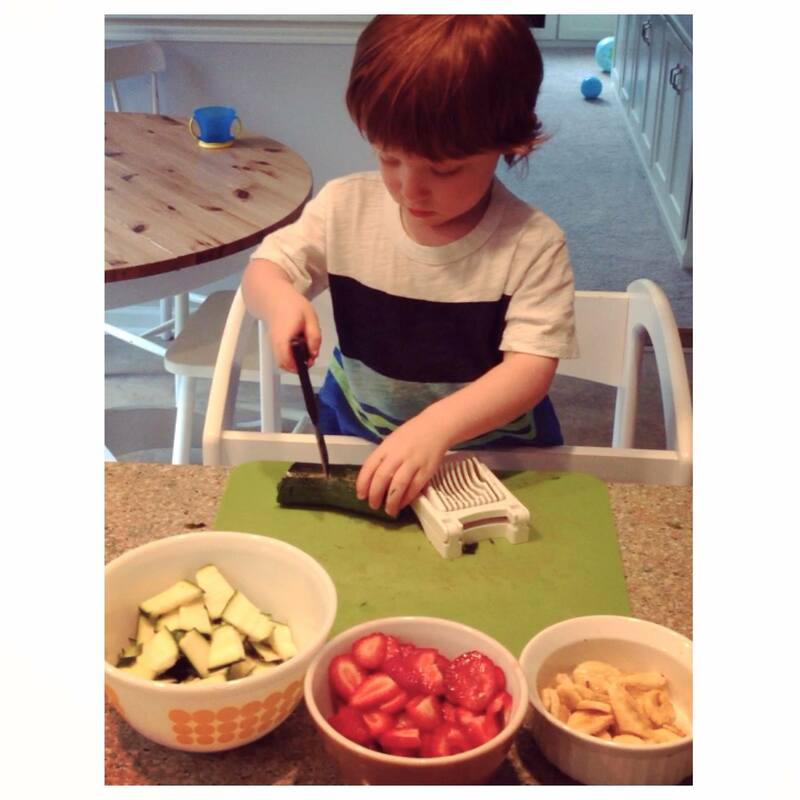 He first used his crinkle cutter to cut small pieces of zucchini to fit in the slicer. After each “cut” he cleared the slices away and put them in a bowl. He also “chopped” nuts in a crank nut grinder/chopper. You can find most of these tools online or in store as they are pretty basic. 1) crinkle cutter with handle (norpro) also makes one – the handle is what makes it better for toddler. 2) egg or strawberry slicer – we have just a basic one of these you can get anywhere, however I’m considering upgrading to a sturdier oxo version, but a cheap one works great as a start. 3) potato masher – I am switching to this style in lieu of my pastry cutter b/c this handle is better – you can use this for potatoes, avocados, batter etc. 4) spiralizer – we eat more paleo at our house so no conventional pasta – we make noodles from zucchini, sweet potatoes etc. there are other uses for this too. Wade helps set the veggie and cranks it to spiralize all by himself. You could do apples with this too. We have a mandolin but that is more difficult so this is a better option for toddlers. 5) nut chopper/mill with hand crank – occasionally they’ll need someone to hold the mill while they crank or unstick the crank if it gets caught on a nut. 5) other kitchen tools for toddler can include – tongs (we have a full size and small oxo size), paring knife (with supervision), spatula, wooden spoon. 6) and of course I HAVE TO mention the Learning Tower again, which makes it so much easier for Wade to be independent and part of the action! Of all possessions Wade has – this is one of the most important! 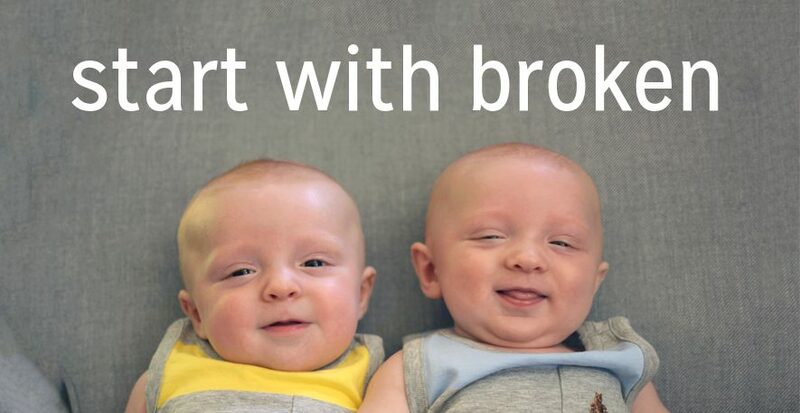 I hope these ideas get your little one started!! And I can’t take credit for all of these great ideas. I am too busy to be a real blog reader, but periodically I go to How We Montessori and take from her ideas. I love the activities of her children – real tools, real tasks, real creativity. Check it out!